There are so many different dolls and toys for girls and boys available these days, it can be tricky as a parent to figure out what the best ones are. Here, we have reviewed a range of black babydolls to help you find the perfect new addition to your child’s dolly collection. You’ll also find some helpful tips to help in your search for the perfect black doll for your child. 0.1 How To Find a Perfect Black Baby Doll? 0.2 What is Different From a Black Doll Apart From the Color? 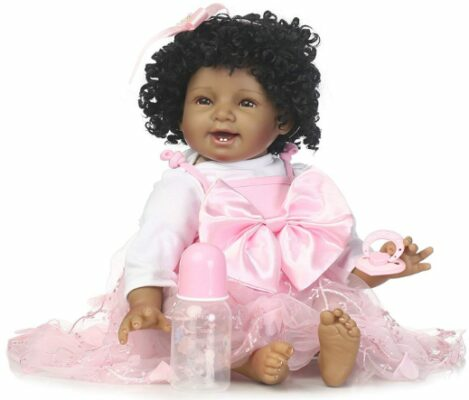 How To Find a Perfect Black Baby Doll? Finding a toy doll your child will love can be difficult. There are so many different options to choose from, it can be a challenge to work out what’s best. You might want to go for something more realistic, especially for older children. For younger kids and toddlers, look for something a bit more simple, which is strong and durable. What is Different From a Black Doll Apart From the Color? Black doll toys share many of the same features as white baby dolls. There is a huge variety of toys available, each offering something different. Children of all races should be able to play with dolls representing different ethnic groups, as it is important to encourage children to learn about different races from an early age. Children from minority ethnic groups will also love to see dolls which look more like themselves. Make – You might want to choose a toy which is made by a big brand. This way, you are more likely to be confident of the quality of the materials used. Some of the best brands of black dolls which are worth looking at are Hasbro and Reborn dolls, although there are a lot of other great options. Type – There are different types of doll toys which are ideal for kids of different ages. Some are aimed at older children and are more collectibles which are designed to sit on a shelf, rather than being played with by toddlers. You can also get twin dolls which are great for kids who often have their friends over to play, or for families with more than one child, so siblings can share. Accessories – Some dolls come with accessories, or they are available to buy separately. Make sure to check the size of the doll to ensure it will fit into the crib, high chair or any other accessories you have got to go with it. You should also check which size of clothes will fit the doll if you plan to buy it more outfits. This beautiful doll is one of the best realistic ethnic baby dolls. It has realistic-feeling skin and the hair and facial details are hand-made to ensure they look authentic. The Ashton Drake doll is aimed at older children and collectors, rather than a toy to be roughly played with by a younger children and toddlers. The black baby boy doll comes dressed in a beautiful outfit and shoes, but he can be changed into real baby clothes in size newborn or 0-3 months, as he measures 22 inches long. Overall, this doll makes a great collectible for children who are looking for a doll to treasure for years to come. These black twin dolls are the perfect size for toddlers and preschoolers to enjoy, measuring around 13 inches. They have a soft body and vinyl head, feet and arms, making them perfect for cuddling! The twin dolls have cute expressions, and come dressed in sweet, matching onesies which are easily fastened with Velcro. The JC Toys twin dolls come in a range of different ethnicities, including Hispanic, Asian and Caucasian. The dollies are great for pretend play with younger children, and they are easy for parents to clean. Their eyes are fixed open, and each doll has a different expression, to ensure you can tell them apart! This stunning reborn doll is perfect for children who are looking for a very realistic doll to cherish. The doll is around 22 inches long and weighs just over 3 pounds, meaning she is the ideal size to wear 0-3 months baby clothing. The body is soft and filled with cotton, whilst the head, arms and legs are made from soft silicone vinyl. Therefore, the baby can be placed in a sitting or lying position, but can’t stand up. The black reborn baby doll comes with some accessories, such as a bottle, a magnetic pacifier which can be held in her mouth, a birth certificate and the beautiful outfit shown in the image below. Overall, this is a gorgeous doll which would make a wonderful addition to an older child’s doll collection. This African babydoll is perfect for children of any age. It’s around 12 inches tall, and has a lovely sweet face which is sure to delight any young boy or girl. The doll is lightweight, making it ideal for toddlers and young children too. It’s made from vinyl, which is easy to clean. The cute ethnic doll comes wearing a sweet outfit with matching headband, as shown below. She has great hair which can be put into a variety of styles, too. The doll can be enjoyed by young children, as there are no small parts which could be a choking hazard. This African babydoll is ideal for children aged around 3-4 years old and above, who love interactive play with their dolls. She comes with a hair comb and a bib to wear when she’s eating her ice cream cone. There is an ice cream scoop also included, which makes the doll appear to really be eating! Girls and boys will love this Baby Alive doll. She’s great for little ones to practice styling hair on, it is just the right size for younger kids to carry around. Parents can rest assured that this toy is made from high quality materials, as the brand name Hasbro is a well-known and trusted one. This tiny, realistic ethnic doll toy is ideal for older children who want a beautiful doll to look after and adore. She is around 10 inches long and weighs less than 1 pound. The realistic black babydoll is made from silicone vinyl, and can be bathed. The eyes are fixed shut, and the baby can either sit up or lie down. The doll comes dressed in the outfit shown, and is sure to bring years of joy to any doll collector. Our favorite, realistic looking toy baby is Ashton Drake’s Michael doll. This reborn doll is simply beautiful, and is sure to be adored by an older child or teenage collector. The soft, authentic feeling skin and hand-finished hair and facial features make this doll perfect for those looking for a very realistic toy doll. The Baby Alive doll is a great choice for younger children who are looking for a doll to play with every day. It has a range of great, interactive elements which are sure to keep kids entertained time and time again. The doll also comes with a few accessories which are great for encouraging imaginative play.